Generally, like performing rights royalties, mechanical royalties go to the songwriter. However, sometimes a songwriter will choose to share these royalties with the rest of the band. If you have a publishing deal, your publisher will receive a percentage of your mechanical royalties before paying them out to you. Mechanical royalties are paid by whoever obtains a mechanical license to reproduce and distribute a piece of music, such as in album form or as ringtone, digital download, or interactive stream. In the U.S., the Harry Fox Agency is the group that issues mechanical licenses and collects royalties to pay out to the rights holders. The easiest way to look at mechanical royalties is to think about a record label planning to release an album. In addition to an agreement to pay royalties on the sales of the album, the label must also obtain a mechanical license for the music on the album and pay those mechanicals. 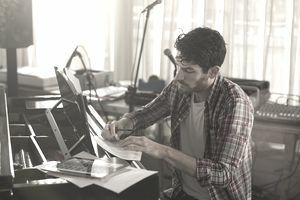 For this reason, there can be several mechanical licenses tied to a single album, depending on how many songwriters contributed music to the release. Record labels aren't the only ones to pay mechanical royalties; they are only the most likely. Anyone who requests and receives a mechanical license is on the hook for paying mechanical royalties. Many songwriters make the major mistake of thinking that because they are members of BMI, ASCAP, or SESAC that they will be paid mechanical royalties. It is not true. To get paid your mechanical royalties, you must be registered for a separate collection society that specifically works on mechanicals. In the US, this group is the Harry Fox Agency, but each country has its own group. If you anticipate collecting royalties internationally, then you must be registered with the groups in each country in which your music is available. This process can be tedious, and in some cases, the workload can even be prohibitive. If you have a publisher, they will handle this task for you. In some cases, your manager may be able to do your registrations as well. Who Should Really Get the Mechanicals? This issue can cause a significant amount of conflict in music groups. After all, if one member has written the songs and is collecting all of the mechanical and performance rights royalties, that could leave the other people who actually performed the music feeling underappreciated (not to mention broke). The rules are clear: Songwriters get mechanical royalties. However, they are not obligated to keep them all. Some do, and some share. Whatever decision you make, it is important that everyone is on the same page before the money starts rolling in. The division of royalties can be handled on the backend when they are paid to the songwriter. Alternatively, you can decide to equally share the songwriting credits officially, when the songs are registered, so that the money is automatically split when it is paid out. Whatever you do, get it in writing. What about when you record a cover song? Should you get to share in the royalties if your take on a track turned it into a hit? "Ha!," said the original songwriter. You do not have any claim on mechanicals for covers, and it is highly unlikely the original songwriter is even entertaining the notion of sharing.